Maharashtra Police raided the homes of prominent Left-wing activists in several states for their suspected Maoist links. 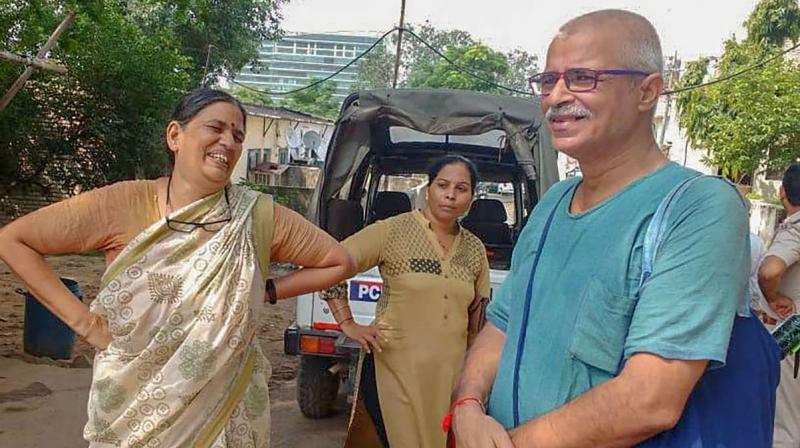 Chandigarh: The Punjab and Haryana High Court on Tuesday stayed the transit remand of activist Sudha Bhardwaj, who was arrested from Faridabad after the Maharashtra Police raided the homes of prominent Left-wing activists in several states for their suspected Maoist links. The courts ordered that she be kept under house arrest till August 30 and not be taken to Pune. The Maharashtra Police on Tuesday arrested at least five Left-wing activists under IPC Section 153 (A), which relates to promoting enmity between different groups on grounds of religion, race, place or birth, residence, language and committing acts prejudicial to maintenance of harmony. The counsels representing Bhardwaj pleaded that her client was a human rights activist and was taken into custody by the Maharashtra Police despite the court order. Bhardwaj was taken from her home at Badarpur border in Faridabad. "Certain documents were given to the detenue, which are in Marathi language, that is not known to the detenue or even her counsel," advocate Ankit Agarwal said. Justice Arvind Singh Sangwan heard the habeas corpus writ petition, advocate Agarwal said. "It is directed that in case the detenue is produced before the Ilaqa Magistrate/Duty Magistrate/Chief Judicial Magistrate, Faridabad, the orders granting transit remand will be passed after going through the contents of the FIR and recording a finding that the provision of Sections 41 and 50 of the Criminal Procedure Code have been compiled with," the high court said. "Till then, the detenue, Sudha Bhardwaj, shall be kept at the place, that is her home at Badarpur in Haryana, from where she was arrested under the supervision of Police Station Surajkund," it said. The next date of hearing has been fixed for August 30, Agarwal said. It was also argued that on the basis of the same set of allegations involving activist Gautam Navalakha's arrest, the Delhi High Court ordered the police not to take him out of the national capital at least until Wednesday.